One of my yummilicious Spicy shrimp recipes which are cooked in banana leaf. This is the perfect way to enjoy the flavor of roasted Shrimps/prawns , i must say. 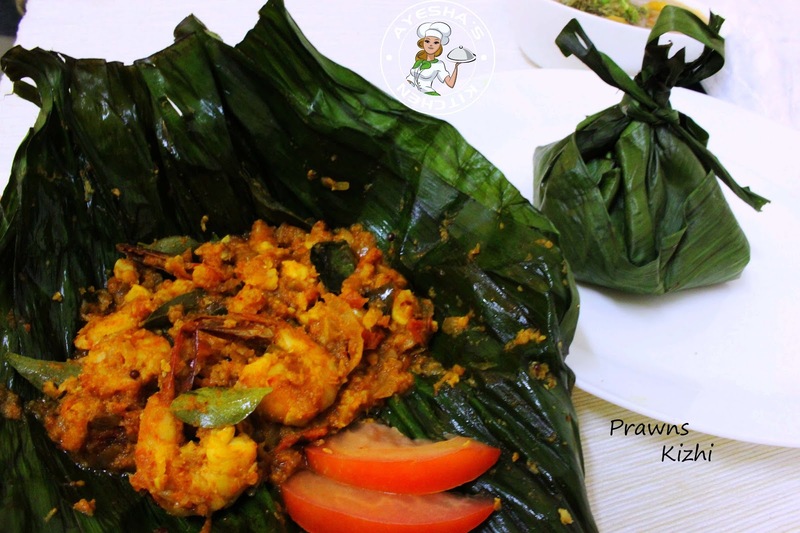 Cooking prawns in banana leaf / banaba leaf are the yet another delicious dish from Malabar cuisine. In the Southern part of India, this dish is named as Prawns kizhi / chemmeen kizhi / konju kizhi / prawns pollichath / chemmeen pollichath. 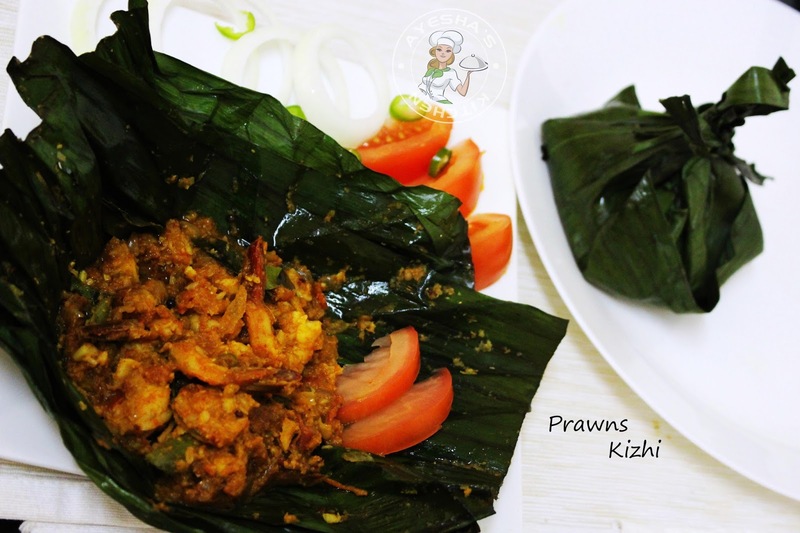 A Kizhi means a pouch in English and here the cooked prawns with the tangy gravy are wrapped in a banana leaf which looks like a pouch / kizhi. Banana leaves impart a fine aroma to the food that is cooked in or served in them. These leafs are not themselves eaten and are discarded after the use. Besides adding flavor to the dish, cooking with banana leaves keeps the juices in and protect the dish from burning. So here is a healthy easy shrimp recipes. Let's see how to make seafood recipes with banana leaf / yummy shrimp dishes /shrimp recipes easy /shrimp recipes healthy / shrimp dinner recipes / Prawns kizhi / konju kizhi. Coarse the coconut chili mixture and set aside. Do not add water while grinding. Heat a non stick with 2 tablespoons of coconut oil. Splutter mustard seed. Then add chopped onion, chilies, garlic, ginger one after the other. Saute until the onion turns slightly golden. Now add curry leaves. When done, add the finely chopped tomatoes and saute until mushy. Then add the chili powder, coriander powder, turmeric powder, fennel seed, and salt. Cook until the oil separates and floats on the top. When done, add the marinated prawns and cook until prawn is 90 % done. Then add the coarse grinned coconut chili mixture or condiment and saute for a minute. Check for salt and Switch off the flame. Take a banana leaf and heat gently on fire to prevent for tearing. As i didn't get big piece of banana leaf, i used 3 small pieces for making one kizhi / pouch. Else you can use two medium sized leaf to make a kizhi. (keeping an additional leaf below the main leaf prevents the breakage of leaf while frying. Spread a tsp of coconut oil over the banana leaf and keep half of the prepared prawn masala over it in the center. Top it with curry leaves and make a kizhi. (hold the edges of the banana leaf together so that the masala will stay at the center of the leaf which looks like a pouch or kizhi. Tie the top of the banana leaf with a thread or with fiber from the banana stem or even with a slice of leaf itself. Repeat the same with the remaining prawn masala. Now heat a pan with 2 teaspoons of oil and place the kizhi or prepared pouch over it. Cover it with a lid and let it cook over a medium low flame for 5-8 minutes. 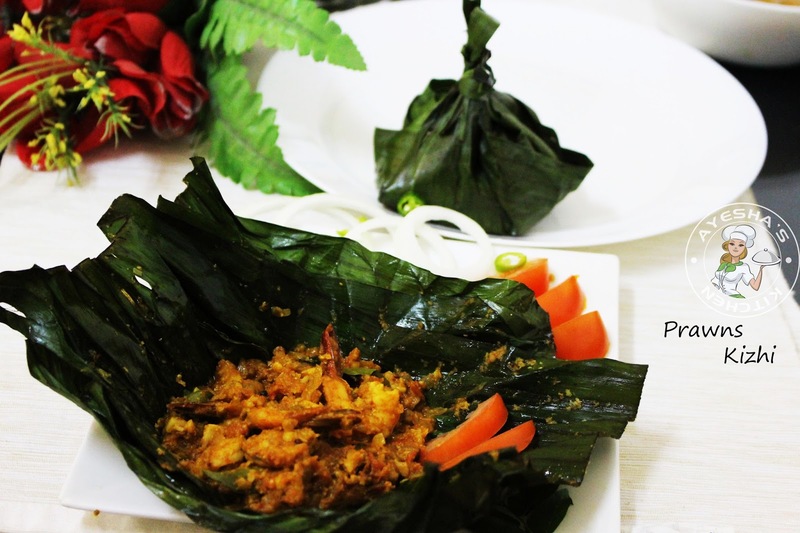 When done, enjoy the yummy flavor of prawns cooked in the banana leaf along with hot steamed rice, chappathi, paratha.